Having data is one thing; using data is everything. MissionView™ brings your data to life to help you monitor changes, make decisions and take action. MissionView software provides easy point-and-click configuration, real-time data display, and management for any NetAcquire system. With MissionView Designer, you can quickly create and configure sophisticated graphic displays that leverage a large predefined library of real-time charts, meters, gauges, and more. 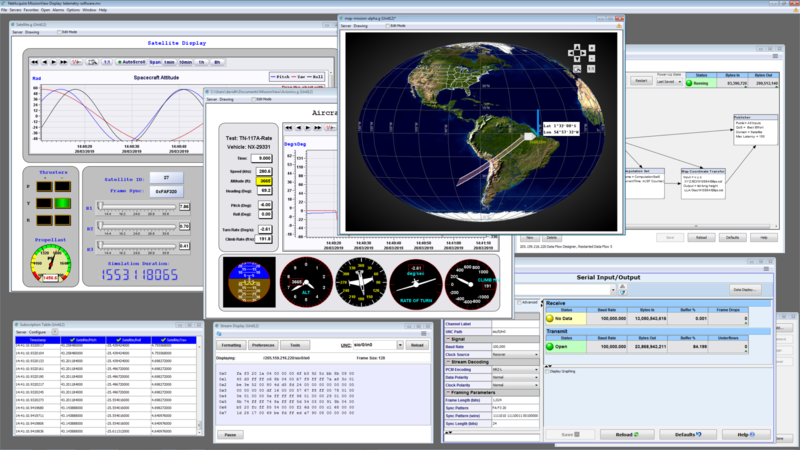 MissionView Display (Base edition) supports GUI configuration and management functions of one or more NetAcquire servers, including decommutation, real-time processing and derived measurands, engineering unit conversion, and recording/playback. MissionView Display (Full edition) includes viewing and customization for the sophisticated graphics displays created with MissionView Designer. It’s easy to conveniently connect any NetAcquire server to display real-time measurement and telemetry data. Other features include data recording and scrolling data display tables. Like many NetAcquire products, MissionView shatters price/performance benchmarks in the aerospace industry. The MissionView Display (Base edition) is free; advanced capabilities for Windows, Linux, and macOS start at $495. The MissionView client/server network interface supports an unlimited number of display stations; it allows deterministic real-time processing on each NetAcquire server prior to display. All low-level details of network input/output, flow control, error detection, and recovery are handled transparently. MissionView can be deployed on any PC-based system including workstations, laptops, embedded smart displays, and rack-mount PCs. MissionView can be integrated with NetAcquire server access control security and encryption. 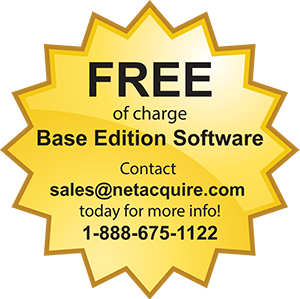 NetAcquire offers MissionView support for multiple operating systems: Windows, Linux, and Apple’s macOS. MissionView works with or without a Web browser. High-performance MissionView data processing and network communications utilize multiple PC processor cores. Data recording of any acquired data is delivered in convenient comma-delimited ASCII format with user-configurable data formatting. Recorded data files are conveniently replayed into drawings, tables, and other displays. Replay options include interactive navigation through recordings (stepping, skipping, and random access forward/backward). Replay speed, start/stop times, and cycling are configurable. Automatic switching is available between live server and replay data. A powerful alarm subsystem detects when user-selectable alarm conditions are met. Different alarm criteria are available with multiple thresholds and ranges. 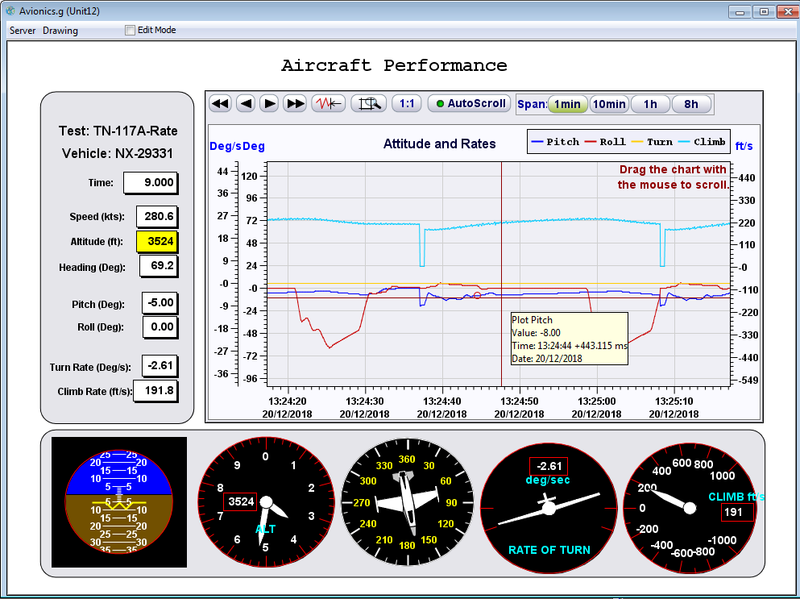 Alarm conditions are displayed with configurable text and colors, and timestamped alarm events are captured to disk. Alarms can be set to “latch” and require explicit operator reset.